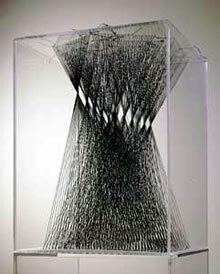 Works specifically relying on, or incorporating, crafts such as embroidery, crochet, weaving and knitting have generally been excluded from this survey of contemporary string art. Not through any wish to downplay their importance or, indeed, the increasing visibility of craft-based techniques within the contemporary canon. It's simply that such territories - occupied by artists including Joana Vasconcelos, Grayson Perry, Tracey Emin, Nicholas Hlobo and Maurizio Anzeri - are so numerous that they'd seem to merit an entire article in themselves. 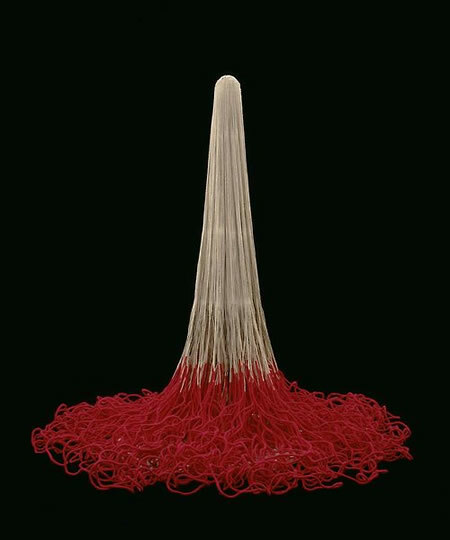 Nevertheless, the post-war influence of the so-called Fibre Arts movement is fundamental not only to the assimilation of traditional craft into fine art spheres, but equally to the development of practices centred on a use of string. 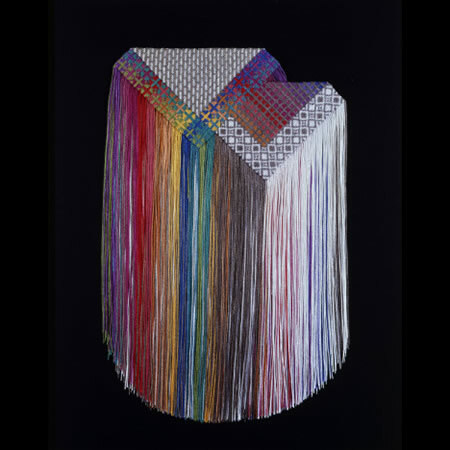 Lenore Tawney is widely regarded as one of its pioneers, her work often credited with precipitating the emergence - and acceptance - of fibre art as a valid 'high' art discipline. 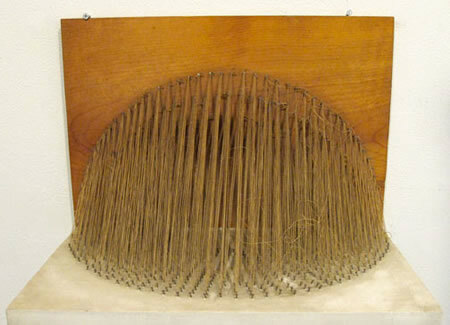 In the late 1950s Tawney developed the revolutionary technique of 'open-warp' weaving, enabling practitioners to bypass the strict rectilinearity of woven forms, and throughout her career continued to push the boundaries of her craft, moving far closer to sculpture than textile production. 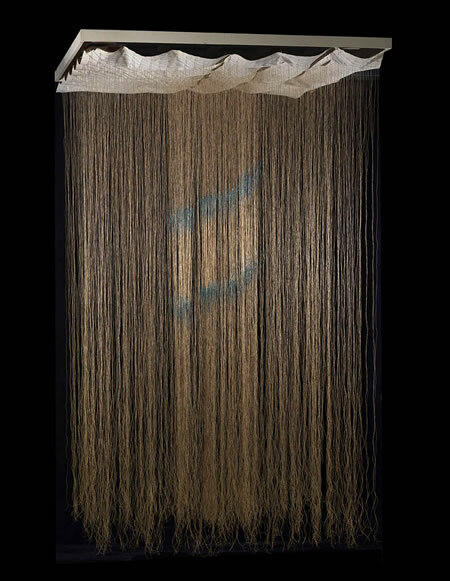 In 1976, she produced the first of her Cloud works, featuring hundreds of linen strands dropping like rain, and in the 1990s began her "drawings in air" series based on sketches completed in the 1960s (below). 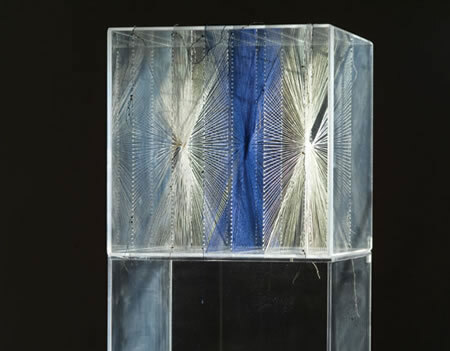 These three-dimensional thread sculptures, which often bear striking resemblance to constructivist works by the likes of Naum Gabo, use transparent Plexiglas to reveal the complex constructions generally obscured by weaving processes. 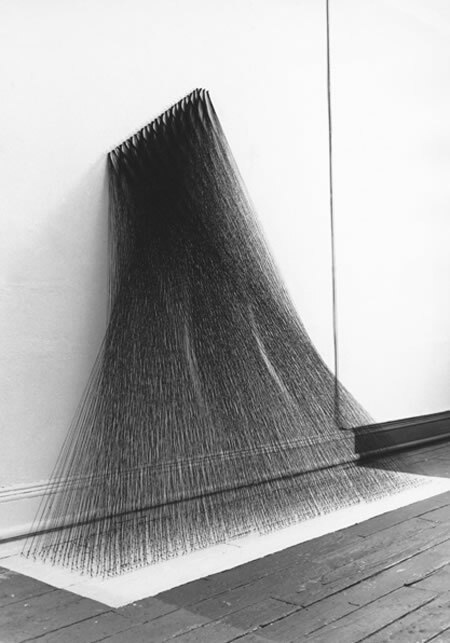 While such examples of Tawney's work bear a particularly striking relationship to much of the contemporary string art featured later in this article, other names associated with the early years of the fibre arts movement have undoubtedly also proved influential; among them are Claire Zeisler (below) and Diane Itter (bottom). Wojnarowicz is an artist whose legacy is still being assessed. 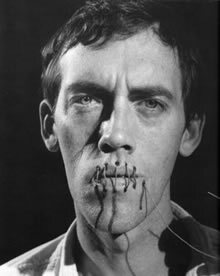 Increasingly touted as one of the most potent voices of New York's edgy 1980s East Village art scene, his practice included collage, photography, painting, performance, film-making and AIDS activism (Wojnarowicz himself died of AIDS-related illnesses in 1992 at the age of 37). Today, one of his best known - and controversial - works is the short film A Fire in My Belly, in which the artist is first shown sewing together a broken loaf of bread, then painfully stitching his own lips shut. Associations with the ritual of Christian Communion segue into a brutally graphic representation of the Silence = Death motto under which many American artists campaigned for adequate response to the early AIDS crisis. 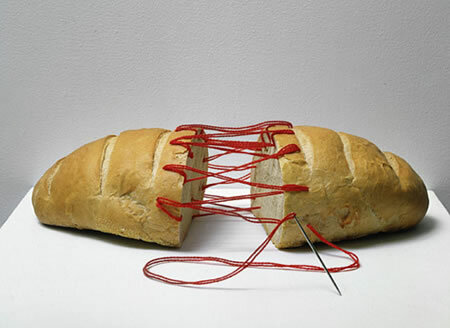 Although Wojnarowicz's images have become particularly well-known, he was not the first to use thread in such a way. In a 1976 performance Talking about Similarity (video still left; documentation below), Marina Abramovic and her (then) partner Ulay enacted a similar scenario intended to reverse and expose the traditional hierarchies of male and female behavioural roles. In a selected site I sit in front of my visitors with my mouth opened wide. The sound of saliva being sucked away can be heard. The sound fades, I close my mouth. I sew up my mouth, and keep sitting. I depart. I take Ulay's place. I answer the visitors' questions for him, until I make a mistake by answering for myself. I depart. 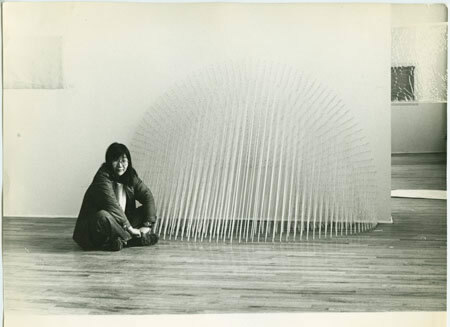 Kazuko Miyamoto is probably the least known of all the artists featured here, yet her influence on string art, paradoxically, may well be amongst the most pervasive. 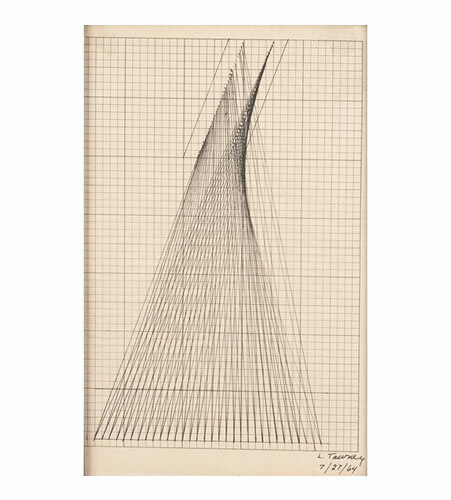 Arriving in New York from her native Japan in 1964, Miyamoto was a founding member of the influential AIR gallery and long-term assistant to Sol LeWitt. 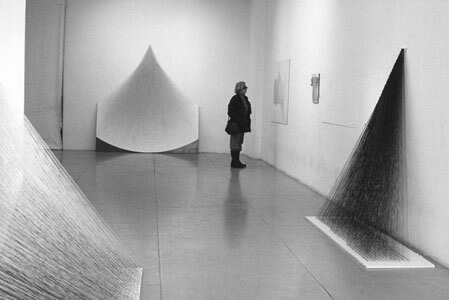 Her string-based installations, many of which date from the early 1970s, meld the geometric precision of pedestal-bound works by the likes of Barbara Hepworth and Henry Moore with the expansive installation methods favoured by artists such as Fred Sandback. 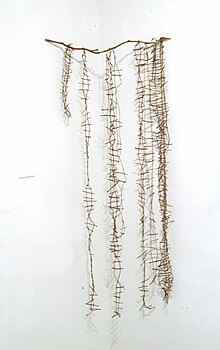 Such developments presage the complex, site-specific tendencies of many of today's artists working with string.